I’ve recently started to loath my microwave for a couple reasons. One being the fact that it takes up way too much counter space in my already tiny kitchen and another is just the incredibly icky feeling I get anytime I stick food in there and turn it on. I began to wonder why my natural instincts were kicking in, screaming at me to back away from the microwave, so I decided to do a little research. After scouring the internet I have made the commitment to ditch my microwave (BTW if you’re reading this honey, we’re getting rid of the microwave). There are a lot of conflicting view points. One study shows that microwaves change the molecular structure of your food and that in turn changes the cellular activity in your body making cancer a high risk. This particular study is highly ridiculed and challenged for not being peer-reviewed or published in any scientific journals. If you do a google search you’ll find numerous articles backing both sides of the argument. I honestly don’t know which argument I believe, but I have to go with my gut on this one. Overall I am trying to adapt a healthier, whole foods diet and eliminating microwaved foods just falls in line with it. Besides, any food that REQUIRES a microwave for cooking can’t be that good for you. Yes, my life may be a little less convenient without my microwave, but the few extra minutes it will take to heat something on the stove and wash that extra pot are worth my piece of mind (AND extra counter space!). 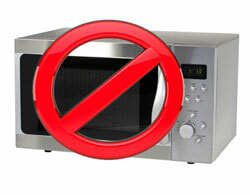 What are your personal thoughts on microwaves?